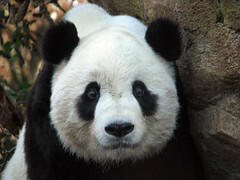 It’s official, The Zoo has set the last day for Butterstick in DC: Saturday, 30 January 2010, and there will be a big party at the Zoo to send him off to the wilds Panda breeding program in China. It’ll run from 11 to 3, and at 1:30, Tai Shan will get his very own “special celebratory treat,” which we’re pretty sure isn’t some sort of strange euphemism, and since pandas don’t eat deer, I think it’ll probably be a bamboo cake of some sort. Extra cool, though? Land O’Lakes got in on the Butterstick thing, and will be showcasing a set of photos of our favorite panda as part of the party. Nice work, DCist! Where did you get your information on the “last day”? Just curious. Shadow: The Zoo emailed us with the release.